Charles Court Opera are one of the leading small companies, known for their innovative approach and described as “the masters of Gilbert & Sullivan in small places”. For their 10th Anniversary, the company have chosen the lesser known tenth of fourteen comic operas by Gilbert & Sullivan. In 1887 Ruddigore initially struggled following the huge success of The Mikado, but after a few re-writes and a re-spelt title (from the original Ruddygore) it was to triumph. Ruddigore, or The Witch's Curse, has an unbelievable plot. A centuries old witch’s curse on the Baronetcy of Ruddigore condemns the eldest sons to commit a crime everyday on pain of death. Heirs understandably try to find ways around this, or abscond, with perilous and confusing results all round, driving fiancées to madness and bridesmaids to despair. It all makes for a fabulous frolic, executed at the King’s Head Theatre with fine singing, acting and an unrelenting energy. Gilbert’s loquacious lyrics are performed at a breakneck pace, yet the skill of John Savournin’s direction and indeed his performance as Sir Despard Murgatroyd is such that every word is savoured and heard and whats more, that it all seems so ridiculously plausible. The Bridesmaids’ constant and very funny refrain ‘Hail the Bridegroom, Hail the Bride’ is a memorable air, made all the more remarkable by Susanna Buckle and Andrea Tweedale effectively emulating a chorus of 22 voices, whilst Cassandra McCowan makes more sense of Mad Margaret than is often to be found in Ruddigore productions. The compact company of just eight sound tremendous, with both acts' finales sung with a gorgeous musicality and a remarkable attention to detail. David Eaton as Musical Director, accompanies with great dexterity and detail throughout as Philip Aiden’s choreography keeps the cast on their toes admirably and literally, given the speed at which they move and sing. James Perkins’ seaside pier design atmospherically enhanced by Nicholas Holdridge’s lighting becomes hysterically effective when we are introduced to the ghostly ancestors. It is profoundly re-assuring to see that in 2014 the spirit of Gilbert & Sullivan is more than alive and well in London’s off-West End. 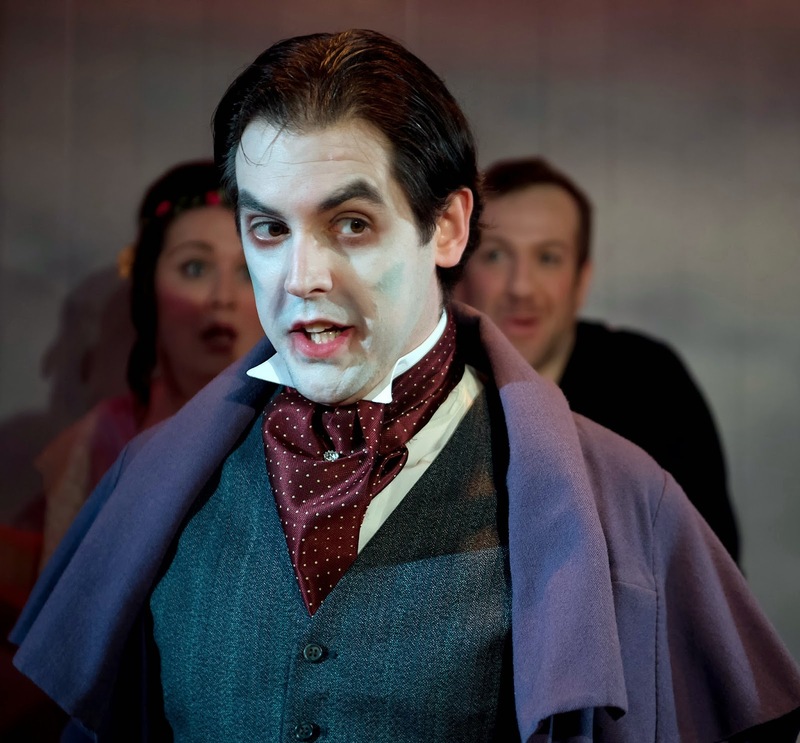 With sparkling melodies, glorious singing and rich characterisation, The King’s Head's Ruddigore makes for a delightful evening of meticulously crafted madness.